The question has been asked many times. How long has Porter been in business? The riddle was solved in a 1962 interview in the Daytona Beach News Journal with Richard Owen Porter. The answer was that the Porter Bait Company had been in business since 1919. Richard Porter was born on March 23, 1892 in Palm Beach, Florida. Richard’s first shop was in his garage and that is where his first bait, the Clothes Pin Bait was made. 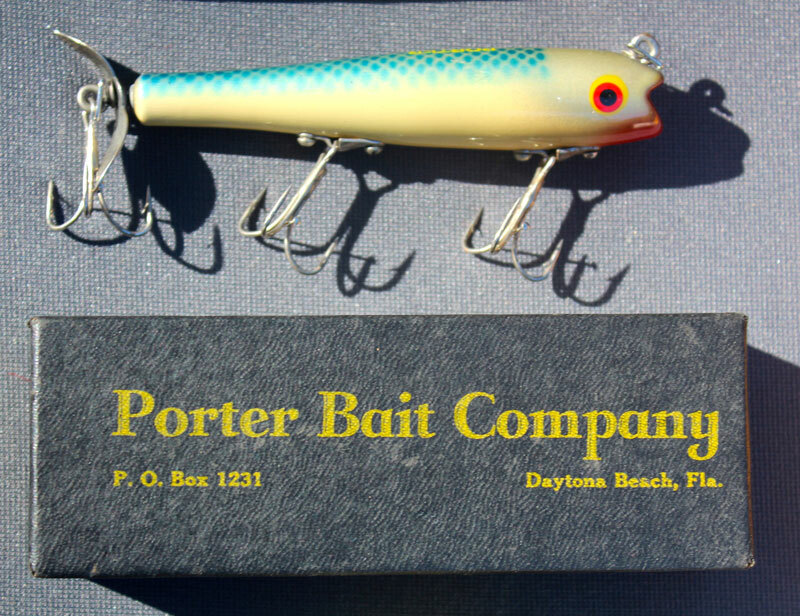 In 1937, Porter and a friend Ray Johnson worked together to form the Dixie Bait Company in Daytona Beach but only lasted two years because of the death of Ray Johnson. This mention of Dixie is because they are another highly sought after manufacturer today. 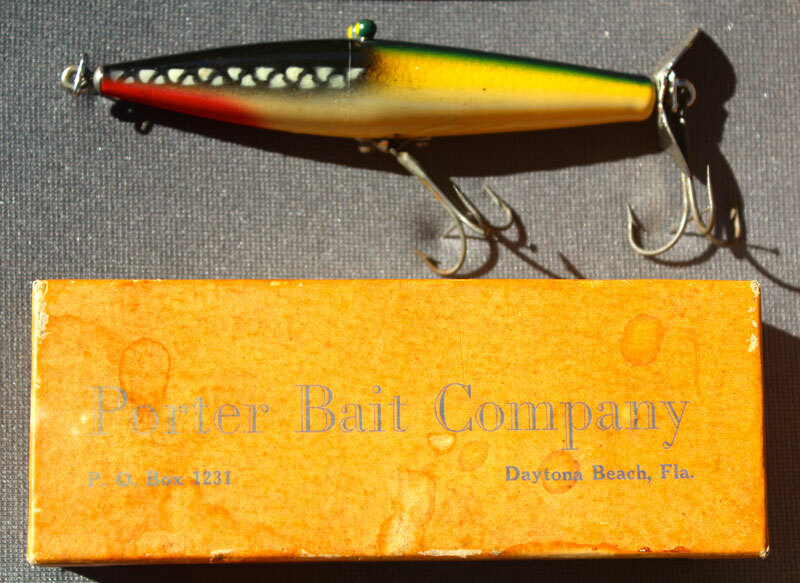 In 1946, Richard Porter formed the Porter Bait Company and the Smart-Alec Popping bait was from this period. The War Assets Administration was in the process of turning over a 29 acre site of the Welch Army Hospital to the city of Daytona Beach. Former Wacs barracks building #104 was the first home of the Porter Bait Company. The swimming pool there soon became Porter’s first bait test tank. 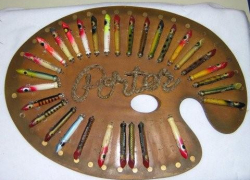 By 1952, the Porter Bait Company was making 15 thousand lures a month. 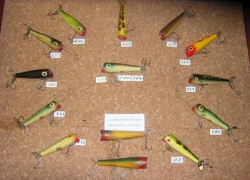 Here are some pictures of the lures that were being made. 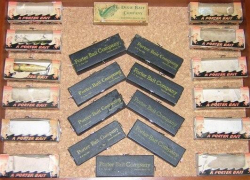 Porter lures were packaged in five different boxes. The first one was a light orange two-piece cardboard box and was leftover boxes from Dixie Bait Co. The next was a two-piece cardboard box that was all black and on the top marked Porter Bait Company in Olive green. The third was a window box to let you see the Bait inside. 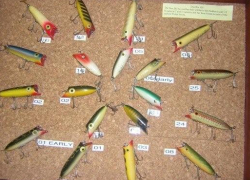 All the boxes were marked “Makers for 25 Years CLOTHES PIN TYPE LURES” .Next was a cardboard box with a plastic lid and only marked company name and address and finally the plastic hinged box without any marking at all. In 1955 Porter Bait Company moved to 605 1/2 Main Street. 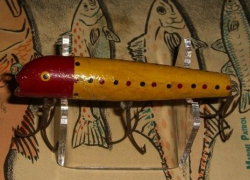 Here is a lure that needs a home in it’s correct place, so it was either here on the Porter page or The Uncle Charley page. 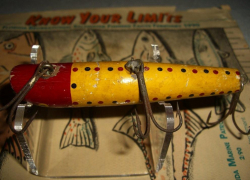 From what I have learned there is a group of lures out there that the experts say is related to Porter and others say this lure was inspired by Uncle Charlie. This will remain here until I hear otherwise, A very interesting lure and perhaps I will bring this one to Daytona Show this year for the expert’s to look at and give it a home. Am I a Porter Lure? MORE ON THE PORTER BAIT CO. STORY WILL BE COMING SOON! Much of the information on this page was obtained by utilizing the information provided by Doug Brace, Bill Stuart, and Russell Riddle in “Florida Lure Makers and Their Lures” (Currently out of print). The information we have provided is only a portion of the story. If interested in purchasing this book, please reach out to other collectors in our forum to inquire about availability.